Custom designed Ovens and Dryers from The CMM Group are available in various models with a wide range of proven air-supply nozzle configurations to meet individual requirements. All designs are available in single or multi-zones with a variety of product support and/or carrier options depending upon the specific application. The CMM Group’s Vertical Tower Dryers are custom designed to provide efficient drying capabilities while taking up minimal floor space. Whatever your specific curing, baking or drying application might be, you can rely on The CMM Group to provide stable airflow management and precise temperature control with PLC driven menus. Backed by an experienced staff with many years of oven and dryer experience, The CMM Group will recommend the appropriate drying technology, nozzle configuration and size to meet individual application requirements. 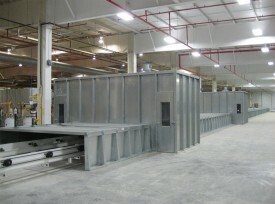 Call (920) 336-9800 to let us know how The CMM Group can assist you with your industrial oven manufacturing needs.